Your new first choice for electronic music production? With a bit of work, Lethal could easily score 4.5, but as it stands, it's still a very good dance music ROMpler with a top-notch library. Tons of quality sounds. Decent editing functions. GUI could do with tidying up. Despite its 'instant music' connotations, the sample-based sound module, aka ROMpler, never seems to fall out of favour. From the classic Roland JV series to IK Multimedia's SampleTank, these bread-and-butter boxes and plugins have been providing music producers with ready-made instrumentation of all kinds for decades, the primary appeal lying in their expansive soundbanks, ease-of-use and quick results. 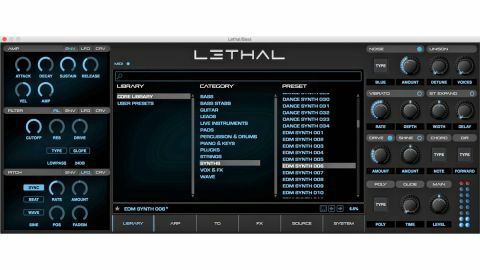 Lethal, the debut release from Australian developer Lethal Audio, is a plugin ROMpler (VST/AU/AAX) built with dance music in mind, clearly taking aim at reFX's hugely successful Nexus2, which fits the same description. Lethal installs in two parts: the plugin and the soundbank, the latter weighing in at 5GB. The Library tab of the central panel is where the 1100+ factory presets (and any edited ones saved into your User Library) are accessed - simply select a Category and double-click one of the presets therein to load it. The left and right panels house Lethal's various sound-shaping controls, enabling fairly radical transformation of the core samples. The Amp, Filter and Pitch sections in the left-hand panel each have their own dedicated ADSR envelope and LFO. The envelopes feature adjustable curves for the Attack, Decay and Release stages, while the LFOs can have their depths modulated by mod wheel input or Channel Pressure. That's where Lethal's modulation setup starts and finishes. The filter itself is surprisingly well equipped, with an extensive selection of modes that goes beyond the usual LP/HP/BP standards with Notch, Low and High Shelf, Peak and AllPass options, and a choice of 6, 12 or 24dB/octave roll-off slopes for all of them. The filter Drive responds nicely, too, and is bipolar, progressively degrading the signal when turned anticlockwise from centre. With the three synthesis essentials - volume, pitch and filtering - covered on the left, the right- hand panel facilitates further processing, including Unison detune (up to eight voices), vibrato, stereo widening, harmonic enhancement (Shine), overdrive, glide, and reverse playback of the source samples. A noise generator can also be dialled in (White, Pink or Blue), while the Chord function automatically builds chords on top of the triggering MIDI notes. Located in the second tab of the central panel, Lethal's Arpeggiator offers Up, Down, Up/Down, Random and Poly modes, Shuffle control and a Strum knob, for spreading the held notes in Poly mode, guitar chord-style. It also doubles as a step sequencer, complete with its own pattern presets. The next tab along opens the equally straightforward stereo TranceGate, again with its own presets menu, for independent left/right rhythmic gating of pads and other sustained tones. Last but not least, the FX tab loads up to six modules at a time, each chosen from a rather predictable roster of seven: Reverb, Delay, Chorus, Phaser, Distortion, Equalizer and Bitcrusher. None of them are going to set the world on fire (particularly the reverb), but they're good enough to get the job done when it comes to mangling or tarting up Lethal's samples prior to mixdown. Handily, the effects can be dragged around to reorder them, and all have their own presets, which really helps to keep things moving when you're 'in the flow'. Lethal sounds great, is easy to work with, and puts a very light tax on the host CPU. The fact that its Arpeggiator and TranceGate effects are relatively basic should be considered a plus, since workflow is everything with a sound module like this - you want to be able to fly around it without getting snagged up in any one element of its architecture. It is, however, a bit rough around the edges, with a few oddities to the GUI, such as the pointless buttons for unidirectional stepping through certain menus (eg, LFO Wave and Filter Type), which are more fiddly than just using the menus themselves. Then there's the haphazard arrangement of the note value menus in the Arpeggiator (Rate) and TranceGate (Rate and Fade In), which present straight, triplet and dotted options hierarchically, invariably with straight values in the second layer, and the other two varying in terms of which comes first or last. Strange and annoyingly inconsistent. Right-clicking to load effects never feels right, either (we'd prefer a left-click menu within each panel), and the poor preset naming and lack of actual drum kits also have to be cited as negatives. Oh, and the manual is evidently a long way from finished. Still, most of those criticisms are very minor, and all could potentially be addressed in future updates. Putting those aside, Lethal without doubt achieves its goal of providing an enormous variety of high-quality dance-orientated sounds, with enough editing and processing to ensure genuine longevity.